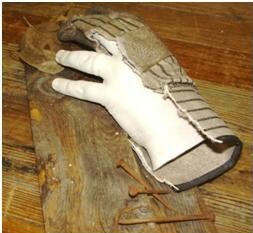 My hand is covered in an old leather work glove. I cut away a few fingers of the glove to illustrate the contrast between the exterior and the interior. The hand hidden inside the glove is pale, delicate, and feminine looking, in contrast to the roughness of its surroundings. The hand can appear to be either completely covered or open and vulnerable, depending on which side it is viewed from. In my life, I have had several facets. The glove symbolizes the ‘rough and tumble’ personality that I developed at a young age as a defense mechanism. A sense of fragility and delicateness lies underneath the rough exterior, symbolized by the white hand and the outline of my wedding band. My sculpture is all about duality– initial appearances can be deceiving. Sometimes you have to dig through a few layers to reach the honesty that hides underneath a protective layer. You do a great job at depicting who you are in writing and art. You leave yourself on the paper/art work almost. That is a rare talent that most do not have. I have been blessed over the years to read and be able to understand you more and more as a friend and as a follower. No matter the times of upset/pain/anger/happiness/love/any other form of annoying emotion, know that you my friend are a true blessing to me and my life.